Courtesy photo The Avalons, a band with a focus on early rock ‘n’ roll, comedy and crazy antics is coming to north central Ohio on April 12, courtesy of the Crawford County Community Concert Association. BUCYRUS — The Avalons, a band with a focus on early rock ‘n’ roll music, comedy and crazy antics is coming to north central Ohio on April 12, courtesy of the Crawford County Community Concert Association. The Avalons (formerly Sh-Boom) had its birth in 1987 when two fellow broadcasters at an oldies station had a conversation about a show they had promoted the night before. They compared notes about the bands, plays and stage shows they had been involved in through the years and decided they could produce a great show with one of their passions…early Rock ‘n’ Roll. They decided that they wanted to be a show with all the entertainment elements…costumes, choreography, audience participation and wacky humor, instead of just another band that played oldies. A wacky comedy style evolved along with the music…and their great 4-part harmonies were complemented with one zany bit after another. Their show was so much fun that a broad following of fans rapidly developed. Sh-Boom was a hit. They performed for the Holiday Inn circuit and clubs, dinner theatre and local festivals. Within a few years, they were headlining at fairs and festivals around the Midwest and east coast. They were soon opening for scores of legendary artists like The Temptations, The Four Tops, Paul Revere and the Raiders and others. A four-day engagement at Springfest in Ocean City, Maryland, landed them a long-term association and even more opportunities to open for acts like The Beach Boys, The Smothers Brothers, America, Frankie Valli & the Four Seasons and even country acts like Mary Chapin Carpenter, Colin Raye, Marty Stewart and dozens of others. They found themselves on nationwide talk shows, performing on cruise lines, for corporate events, fundraisers and concert and arts venues. Seats are still available for the 7 p.m. show April 12 at Bucyrus Elementary School, 245 Woodlawn Ave., Bucyrus. 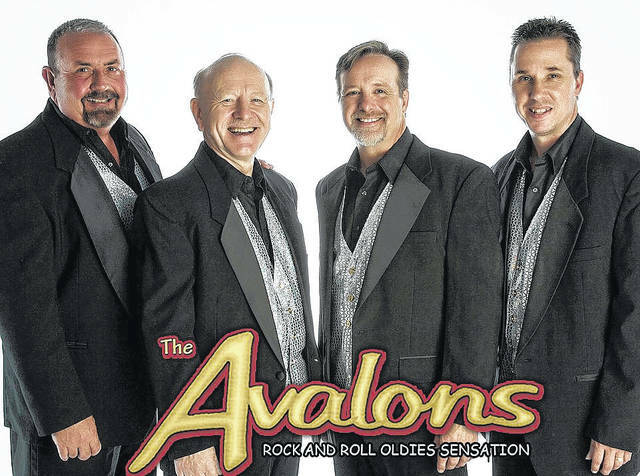 For information, call 800 965-9324.
https://www.galioninquirer.com/wp-content/uploads/sites/38/2018/03/web1_the-avalons.jpgCourtesy photo The Avalons, a band with a focus on early rock ‘n’ roll, comedy and crazy antics is coming to north central Ohio on April 12, courtesy of the Crawford County Community Concert Association.